The official reference manual for TADS 2. This manual provides detailed documentation for the TADS programming language, the built-in functions, the adventure object library, the player command parser, the compiler and tools, and more. No previous programming experience is required - the book includes tutorial material to help you get started if this is your first programming language. The Author's Manual was originally distributed as a printed book, but is now on-line for easy Web viewing. This version is Neil K. Guy's expanded and revised edition, which merges the original Author's Manual from TADS 2.0 with the TADS Parser Manual from version 2.5.5, and also includes HTML TADS information and numerous other additions and updates. As TADS 2 continued to grow and evolve after the original version 2.0 release, some of the material in the Author's Manual - particularly the sections on the player command parser - became outdated. Each new software update came with release notes describing the changes, but eventually the cumulative weight of the updates demanded an overhaul of the manual. The Parser Manual was the result: a whole new manual, dedicated entirely to the operation of the parser, fully up-to-date with the software. 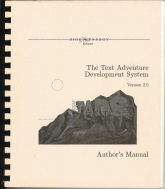 Thanks to Neil K. Guy, the Parser Manual was eventually merged back into the on-line edition of the Author's Manual, so to some extent the latter is your one-stop-shopping guide to TADS 2. However, the PM includes some small updates made since the merger (which represents version 2.5.5), so we still offer the PM as a separate book. These books are copyrighted by their authors. In general, they may be used and distributed without charge, subject to certain restrictions. Please see the individual books for full copyright and licensing information.